Our comfy and cosy collection of plus-size sleepwear is a dream come true. Get a good night's sleep in our gorgeous nighties or our floral, cotton pyjama pants. Our luxe fabrics and attractive designs mean you can relax in style. You won't be able to help looking forward to bedtime so you can change into our lovely sleepwear after a long day. 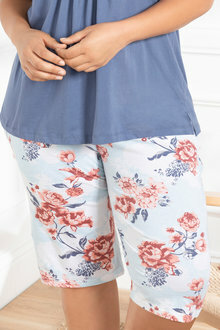 You won't be embarrassed to open the door while wearing pyjamas from our luxurious collection of plus size sleepwear. Our range includes lovely nighties, comfortable tees, gorgeous pants and soft robes. Hot, summer nights are much more bearable when sleeping in lightweight, premium cotton nighties or shorts and a singlet. Mix floral prints and different patterns for a chic bedroom look. Rug up in winter with a soft, micro-fleece robe, or cover up in the warmer months with a light, waffle-weave, cotton dressing gown. Treat yourself, with our sleepwear essentials. Browse our extensive selection of plus size clothing, and you will be able to feel like a queen all day, not just in the bedroom!